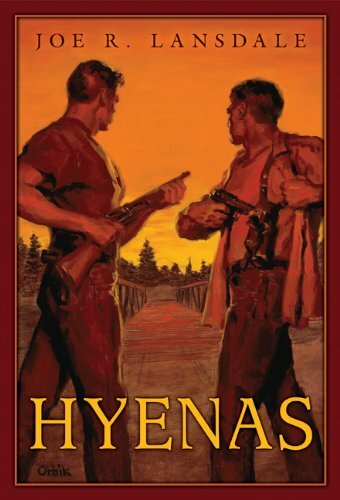 Hap and Leonard are back in HYENAS, a hardcover novella from the small publisher Subterranean Press. Just out, this also includes a Hap Collins short story, THE BOY WHO BECAME INVISIBLE, which recounts an incident from Hap’s childhood. Hap is called down to a bar called the BIG FROG CLUB with the simple admonition that “Leonard is in trouble.” He arrives to find cop cars around, lights flashing, Leonard sitting on a curb holding a bloody rag to his head, and a man laid out near him, his face a jumbled mess with some of his teeth lying on his chest. It seems three men had called him a queer and when he stood up, hit him with a chair. They started the fight, but Leonard finished it. There was a lot of giggling going on amongst the cops and Hap was told to check the inside of the bar out. One man’s head had been rammed through the sheet rock wall of the bathroom, provoking the mirth, leaving him stuck there with his head over the toilet. Hap contributed to his discomfort by taking a piss and not flushing. The next morning the police chief tried to put on a stern face with Hap and Leonard, but told them one of the three started it and it was a case of self defense on Leonard’s part. An even bigger surprise came when that third man was waiting on them and offered to buy coffee. Kelly Smith explained that he hadn’t really been with the other two, but had come to the bar looking for help. The other two had decided to impress him by jumping Leonard and he’d got caught up in the mess. He now wanted to hire Leonard, and Hap, to do a rough job for them. get his kid brother, Donnie, out of trouble. The young man was involved with a bunch that Kelly, from listening in on conversations, was to be the getaway driver on an armored car job. He offers them $10,000 apiece to get his brother free of these men. They finally agree to look into it and the story takes off in a tightly compact little story involving lots of action, a kidnapping, and a final showdown as only Lansdale does so well. We have that sparkling humor, violence, and that love between two friends so different. A nice little bridge for me in anticipation of the new novel just out and soon to be winging it’s way to the house. This looks good. Didn’t he just publish a full length Hap and Leonard novel? Yes, Charles, DEVIL RED, I believe, is the title.